This iconic Warrumbungle National Park walk is famous for its wildlife and vistas of rugged volcanic landscape. Breadknife and Grand High Tops walk is the jewel in the glistening crown and is must do for bush walkers who love a challenge with their scenery. The track follows Spirey Creek before climbing steeply to give close encounters with iconic formations such as Belougery Spire, Bress Peak and Crater Bluff. This image belongs to the travel and nature stock photo library. This stock photo of Belougery Spire at Sunset is available for licensing for commercial and editorial uses including websites, blogs, books, magazines, brochures and advertising. Restrictions may apply for images which contain third party copyrighted material or sensitive subjects. Photos of artwork are for editorial use only. 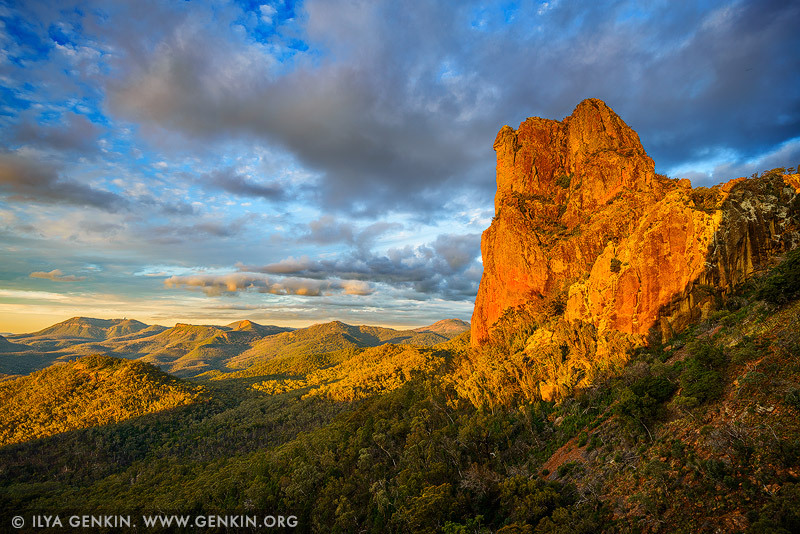 This image id AU-WARRUMBUNGLES-0002 of Belougery Spire at Sunset, is copyrighted © by Ilya Genkin. This is not a public domain image.